Flight is a 2012 American drama film directed by Robert Zemeckis and written by John Gatins. 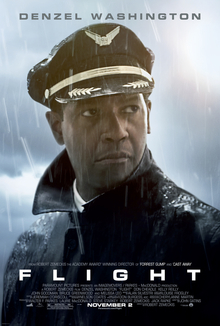 It stars Denzel Washington as William "Whip" Whitaker Sr., an alcoholic airline pilot who miraculously crash-lands his plane after it suffers an in-flight mechanical failure, saving nearly everyone on board. Immediately following the crash, he is hailed a hero, but an investigation soon leads to questions that put the captain in a different light. This film is inspired by the plane crash of Alaska Airlines Flight 261. A box office success generating positive reviews, Flight is the first live-action film directed by Zemeckis since Cast Away and What Lies Beneath in 2000, and his first R-rated film since Used Cars in 1980. The film was nominated twice at the 85th Academy Awards, for Best Actor (Washington) and Best Original Screenplay (Gatins). Airline pilot Captain William "Whip" Whitaker Sr. uses cocaine to wake up after a night of little sleep in his Orlando hotel room. He pilots SouthJet Flight 227 to Atlanta, which experiences severe turbulence at takeoff. Copilot Ken Evans takes over while Whip discreetly mixes vodka in his orange juice and takes a nap. He is jolted awake as the plane goes into a steep dive. Meanwhile, heroin addict Nicole Maggen is on the verge of being evicted. She overdoses on heroin and has to be wheeled out of the house by a paramedic. SouthJet Flight 227 flies inverted overhead in the midst of its rapid descent. Unable to regain control, Whip is forced to make a controlled crash landing in an open field, losing consciousness on impact. Whip awakens in an Atlanta hospital with moderate injuries and is greeted by his old friend Charlie Anderson, who represents the airline's pilots union. He tells Whip that he managed to save 96 out of 102, losing two crew members and four passengers, but mentions his copilot is in a coma. Whip sneaks away for a cigarette in the stairwell and meets Nicole, who is recovering from her heroin overdose in the same hospital. The next morning, his friend and drug dealer Harling Mays picks him up from the hospital. Having retired to his late father's farm, Whip meets Charlie and attorney Hugh Lang, who explain that the National Transportation Safety Board (NTSB) performed a drug test while he was unconscious. Results showed that Whip was intoxicated during the flight. Hugh promises to get the toxicology report voided on technical grounds. Meanwhile, Whip visits and soon becomes intimate with Nicole, but Whip's drinking habits clash with Nicole's attempts to stay drug-free. Later at a crew member, Trina's, funeral, he attempts to persuade a surviving flight attendant, Margaret Thomason, to tell the NTSB that he was sober. Whip pays a visit to his co-pilot Ken Evans after he awakens from his coma. Evans has likely lost much of his ability to walk and may never pilot an airplane again. Although upset, Evans has no intention of telling the NTSB that Whip was drinking. Nicole decides to separate from Whip, following his failed attempts to stay sober. Hounding Whip, the media catches him drunk after he spontaneously drives to the home of his ex-wife and son, both of whom resent him. He stays with Charlie until the NTSB hearing, vowing not to drink. The night before the hearing, Charlie and Hugh move Whip to a guarded hotel room with no alcohol. Although his minibar is empty, he finds the door to an adjacent room unlocked and raids its minibar instead. Whip is discovered by Charlie the next morning, passed out and still drunk. Harling is called, who revives him with cocaine. At the hearing, lead NTSB investigator Ellen Block explains that a damaged elevator assembly jackscrew was the primary cause of the crash. She commends Whip on his valor and skill and notes that no other pilot was able to land the plane in trial simulations of the crash. She then reveals that two empty vodka bottles were found in the plane's trash, despite the fact that beverages had not been served to passengers, and that Whip's test was excluded for technical reasons. The only other member of the crew to test positive for alcohol was Trina, who died in the crash, and with whom Whip had spent the night before. Whip, unable to bring himself to blame Trina for his actions, admits to being intoxicated the day of the crash. Thirteen months later, an imprisoned Whip tells a support group of fellow inmates that he is glad to be sober and does not regret doing the right thing. Whip is seen looking at pictures of Nicole, family, and friends on the wall of his cell, along with greeting cards congratulating him on being sober for a year. He is working to rebuild his relationship with his son, who visits to talk with him about a college application essay on "the most fascinating person that I've never met." His son begins by asking, "Who are you?" As a plane flies overhead, Whip replies, "That's a good question." Denzel Washington and Kelly Reilly in Paris at the film's French premiere, January 2013. Denzel Washington as William "Whip" Whitaker, Sr.
Justin Martin as Will Whitaker, Jr.
Robert Zemeckis entered negotiations to direct in April 2011, and by early June had accepted, with Denzel Washington about to finalize his own deal. It was the first time Zemeckis and Washington worked together on a motion picture. By mid-September 2011, Kelly Reilly was in negotiations to play the female lead, with Don Cheadle, Bruce Greenwood, and John Goodman joining later in the month, and Melissa Leo and James Badge Dale in final negotiations. Screenwriter John Gatins said in early October 2011 that production would begin mid-month. Flight was largely filmed on location near Atlanta, Georgia, over 45 days in November 2011. The film's relatively small budget of $31 million, which Zemeckis later calculated was his smallest budget in inflation-adjusted dollars since 1980, was due to tax rebates from Georgia and from Zemeckis and Washington having waived their customary fees. Gatins explained in a 2012 interview with the Los Angeles Times that the dramatic fictional crash depicted in Flight was "loosely inspired" by the 2000 crash of Alaska Airlines Flight 261, which was caused by a broken jackscrew. That crash had no survivors. The airplane in Flight, a two-engine T-tail jet airliner, appears to be from the same model family as Alaska Airlines 261, a variant of the MD-80. Many elements from the accident were used in the film such as the cause of the accident, segments of the radio communication, and the decision to invert the airplane. Flight opened in 1,884 theaters across North America on November 2, 2012. In its first week, the film ranked second in the domestic box office, grossing $24,900,566 with an average of $13,217 per theater. Flight earned $93,772,375 domestically and $68,000,000 internationally for a total of $161,772,375, well above its $31 million production budget. Flight received mostly positive reviews from critics. The film has an approval rating of 78% based on a sample of 228 critics on Rotten Tomatoes. The site’s consensus states "Robert Zemeckis makes a triumphant return to live-action cinema with Flight, a thoughtful and provocative character study propelled by a compelling performance from Denzel Washington." Metacritic gives the film a weighted average score of 76 out of 100 based on reviews from 40 critics. Denzel Washington's performance received praise from various critics. The Hollywood Reporter's Todd McCarthy wrote that the film "provides Denzel Washington with one of his meatiest, most complex roles, and he flies with it." Roger Ebert of the Chicago Sun-Times gave the film four stars (out of four) writing, "Flight segues into a brave and tortured performance by Denzel Washington—one of his very best. Not often does a movie character make such a harrowing personal journey that keeps us in deep sympathy all of the way." He also noted the plane's upside-down flight scene was "one of the most terrifying flight scenes I've ever witnessed" and called the film "nearly flawless". Ebert went on to name the film the sixth best of 2012. Although the film was not nominated for Best Picture, he later noted that he felt it deserved to be. Entertainment Weekly wrote, "Denzel Washington didn't get an Oscar nod for nothing: His performance as an alcoholic airline pilot ensnared by his own heroics is crash-and-burn epic." The film received some criticism from airline pilots who questioned the film's realism, particularly the premise of a pilot being able to continue flying with a significant substance-abuse problem. The Air Line Pilots' Association in an official press release dismissed the film as an inaccurate portrayal of an air crew and stated that "we all enjoy being entertained, but a thrilling tale should not be mistaken for the true story of extraordinary safety and professionalism among airline pilots." Airline pilot Patrick Smith also commented that "a real-life Whitaker wouldn't survive two minutes at an airline, and all commercial pilots—including, if not especially, those who've dealt with drug or alcohol addiction—should feel slandered by his ugly caricature." The pilot also criticised the portrayal of the relationship between copilot and captain, the decision of Whitaker to increase speed dangerously in a storm, and the ultimate dive and crash landing of Whitaker's aircraft. ^ a b McCarthy, Todd (October 15, 2012). "Flight: New York Film Festival Review". The Hollywood Reporter. Retrieved October 24, 2012. ^ Horn, John (October 20, 2012). "How the movie 'Flight' got off the ground". Los Angeles Times. Retrieved November 4, 2012. ^ a b "Flight". boxofficemojo.com. Box Office Mojo. ^ Kit, Borys (April 20, 2011). "Robert Zemeckis in Talks for Live-Action 'Flight' With Denzel Washington Circling". The Hollywood Reporter. Retrieved October 20, 2012. ^ Zeitchik, Steven (June 3, 2011). "Robert Zemeckis finally looks to take 'Flight'". Los Angeles Times. Retrieved October 20, 2012. ^ White, James (September 13, 2011). "Kelly Reilly Takes Flight". Deadline Hollywood. Retrieved October 20, 2012. ^ a b Morris, Clint (September 22, 2011). "Exclusive: Cheadle, Greenwood join Zemeckis's Flight". Moviehole.com. Retrieved October 20, 2012. ^ Fleming, Mike (September 28, 2011). "John Goodman Boards Robert Zemeckis' Flight With Denzel Washington". Deadline Hollywood. Retrieved October 20, 2012. ^ Kit, Borys (September 30, 2011). "Melissa Leo, James Badge Dale Booking 'Flight' (Exclusive)". The Hollywood Reporter. Retrieved October 20, 2012. ^ Warner, Kara (October 5, 2011). "Denzel Washington's "Flight" Is 12 Years In The Making". MTV. Retrieved November 7, 2011. ^ a b c Horn, John (21 October 2012). "How the movie 'Flight' became airborne". Los Angeles Times. Retrieved 23 October 2012. ^ Flight used a former American Airlines MD-82, N442AA, the main fuselage for the crash mock-up, a more complete nose for filming, and a former Delta Air Lines MD-88, N901DL, and for on stage work, a former Continental Airlines MD-82, N16807. "'Flight' the Movie". Airliner World Magazine. No. April 2013. ^ "Filming Hollywood's Flights of Fantasy, by Christine Negroni". Airways. January 7, 2013 – via Airways Magazine. ^ Ebert, Roger. "Roger Ebert Flight review". Chicago Sun-Times. Retrieved 2 December 2012. ^ Ebert, Roger. "Ebert's Top Movies of 2012". Chicago Sun-Times. Archived from the original on January 17, 2013. Retrieved August 20, 2013. ^ Entertainment Weekly Staff (February 8, 2013). "The Must List". Entertainment Weekly. New York: Time Inc.: 8. ^ Smith, Patrick (November 18, 2012). "Real Pilots Laugh at 'Flight'". The Daily Beast. Archived from the original on November 27, 2012. Retrieved November 26, 2012. ^ ALPA News Release. Alpa.org (October 31, 2012). Retrieved July 13, 2013. ^ a b Real Pilots Laugh At ‘Flight’. The Daily Beast (November 18, 2012). Retrieved July 13, 2013. Wikimedia Commons has media related to Flight (2012 film).